1.Why swainstones price is so much higher than MC? Ans: First of all,our price is higher than MC indeed,but the price gap is not so wide. Secondly,our stones have 14/16 cutting facets,extremely strong glue(Austria stone glue),which is much different from normal MC.You can see the difference from the first glance.Swainstone's glue can endure any kind of wash test and stones never fall off while MC stones fall off easily. 2.How to test the quality? Ans: firstly,you can put Austria stone and our stones together,with the glue bottom down and crystal stones up to see if you can tell our stones apart from those top quality in the world.Secondly,after testing the shiny effect,let us test the glue of our stones.The first step: make a motif using Austria stone,normal MC stones and our stones.The second step: apply the motif into a normal fabric and start a regular wash test to see which type of stones fall off first and which one stays longest.The one who stands most times of wash test surely should be the best quality. 3.I am not sure if I can make money from your stones,because in our market,competition is fierce and price is very low. Ans: In Middlest market like Dubai,MC price is indeed extremely low,but let us ask ourselves honestly,is the profit margin big enough? Let's face the problems bravely,first of all,the price war has been witnessed each day.Every supplier's price is lower than another one.Who can make enough profit from this bad condition in the long term?Secondly,buyers' complaints are becoming more and more than ever,why your glue is so bad,it can not stand 1 wash test! It ruineded my dress!Why your MC not so shinny as before.At this moment,what is your answer to your customer,can you tell your customers that some Chinese suppliers cheated on you and sold you low quality stuff.No,you can not.And if you think about the price your Chinese supplier offered to you,you should know your poor Chinese supplier didn't get big profit from your business as well. The price war is onging in China and in middlest market as fierecely as the same,which squeezes our profit,ruins our reputation,and incurs lose beyong our imagination. At this historical moment,both Chinese and middlest partners both need make a sigificant change.Let's make us some difference.Let's bring a new high quality stones which is different from other stones.Let's make our customer requirment fully met. Only high quality can endure the hardest test and never be beated. 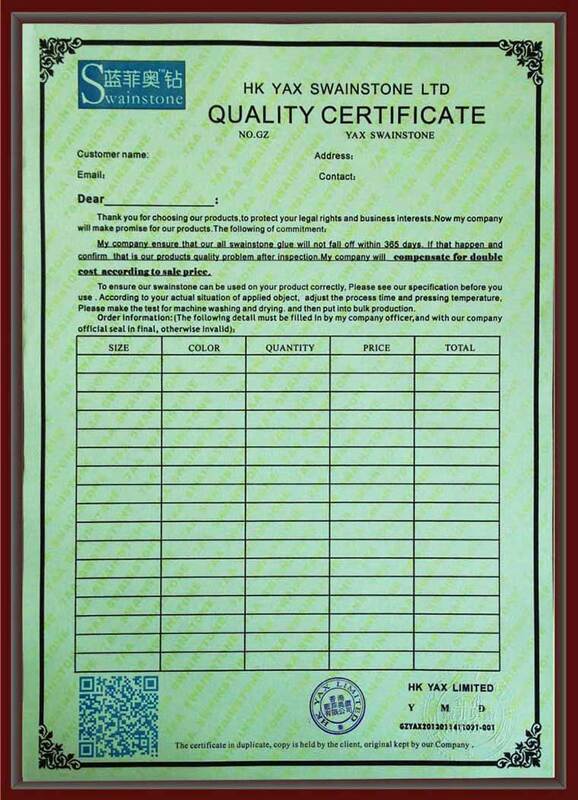 4.Can you guarrantee your quality?Which kind of warrant can you provide? Ans: Yes,we absolutely guarrantee our quality.Quality is our centerprise's life. We guarrante our agency buyers that within 6 months,you can return your goods to us,no need any reason.And you can get your fund back immediately after you return the goods.A official legal contract can be signed and relevant clause can be stipulated within. 5.What can you do for me before I place a trial order? Ans: We can send you free samples,a free catalog and any necessary information you may need. 6. Then in a word,what risk shall I take? Ans: You take no risk. 7.Can you offer some discounts for bulk quantity? Ans: We don't offer discount to any buyers to make sure all of our clients enjoy a fair competition. And we selcect some agents from different areas.To our honorable agents,we offer a special agency price which is also uniform but lower than our general price. 8.Which markets swainstons fit for? Ans: European markets,Middlest market,North american market and Brazil,Mexico. 1. When will be more suitable for contact with us? Is there any other direct contact method? Our working time is from 8:30 am to 18:00 pm in Beijing time zone, it will be more suitable to contact us in this period. Except in this time, you can give us a call, the mobile's number is 0086 13725490880, 13724801597. Email, and Msn will be more favorable. 2. We want you to help us produce hotfix motifs, but we worry about the displacement of rhinestones during shipping, any solution method? Please don't worry, because our unique shock-like package can avoid of it. Using hard cardboard at corner and around sides, with vacuum shrink film outside, last it was packed into carton. We assure that we will take charge of it displacement during shipping. 3. We are Americans, the new environment protection law is published recently, which prescribes that lead content is less than 300ppm. How about your rhinestones? Whether passed any inspection? Yes, we have special environment rhinestones, which lead content is less than 1ppm, nearly 0ppm. As for colorful rhinestones, the lead content is only less than 90ppm, far lower than law rules. Our rhinestones have got SGS and NTERTEK certificate. 4. Can you design for us specially? Certainly, all our motifs are ordered by our clients, you just send us the drawing or pictures of your imagines, we design them for you. 5. How about the producing time? Usually speaking, 2-3 days will be ok, according to your total order. Avoid of motifs deformation and rhinestones moving during the delivery, we use plastic film pack the hot fix motifs in vacuum. The usual delivery method is by express, such as DHL, FEDEX, UPS, TNT, etc. If total order is larger, delivery by air and sea are both acceptable. 8. How to pay for the order? Generally speaking, if the total value of your order is less than USD3000, full payment in advance. If more than USD3000, 50% of total value as deposit is in advanced, and the rest value have to be paid before delivery. Payment by T/T and western union are both acceptable. The older clients can get the message of new designs and products in first time, also the samples of new samples.